Dutch rail infrastructure manager ProRail has released video footage of a motorist’s dangerous exploits at a level-crossing. 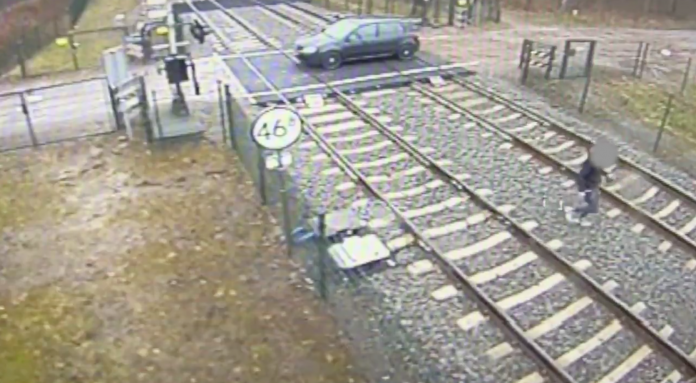 In the video a member of the public is seen driving a car onto a level crossing in the Netherlands. Once parked in the middle of the crossing, a passenger hops out of the vehicle and runs onto the track to take a number of pictures of the vehicle from different angles. In total the vehicle obstructs the level-crossing for more than one minute. The video has surfaced following the installation of solar-powered mobile cameras by ProRail at hotspots across the network. Currently more than 3,500 cameras have been rolled out to fight vandalism, unauthorised track access and prevent suicides. Images from these cameras are viewed by employees in a control room who can then contact emergency services if needs be.